mission is to support development and adoption of new technologies for efficient relief and development operations. GINA also aims at bringing together a community of relief and development professionals, IT developers and data collecting volunteers to deliver geographical data through the latest technology solutions. GINA delivers software and hardware tools specially built for humanitarian and development agencies. Remotely manage your people and units from everywhere. Automatically collect and share geographical data. Better coordination for less work and easier reporting. Helps to prevent car accidents, kidnapping and carjacking. Significantly shortens incident response time. Serves as incident management and communication tool. GINA International mission is to support development and adoption of new technologies for efficient relief and development operations. We also aim to bring together a community of relief and development professionals, IT developers and data collecting volunteers to deliver geographical data through latest technology solutions. Automatic geo-data collection & fast data input and sharing. Significantly shorten incident response time. Serve as incident management and communication tool. GINA aim to bring together community of relief and development professionals, IT developers and data collecting volunteers to deliver geographical data though latest technology solutions. Simple and fast field data collection done anywhere using a mobile app and online forms or by importing existing data. Easy-to-use mapping interface allows you to work with tailored data layers. Project sites locations and other information displayed in various data layers, imported, edited and shared in real-time. Simple sharing of selected data with your colleagues or partner organizations, showing all changes in real-time. Provide support, instruction and information to your remote teams. Secure two-way communication, maps and documents sharing in real-time. Faster and easier reporting through integrated data visualization and various export options. Real-time information and map sharing within a selected user group allows you to inform or instruct your colleagues in field. Multiple user roles ensure that everyone sees only what he or she needs. Simple and fast field data collection done anywhere using mobile app, online forms or by importing existing data. Easy-to-use mapping interface allow you to work with tailored data layers. Project sites locations and other information displayed in various data layers, imported, edited and shared in the real-time. Provide support, instruction and information to your remote teams. Secure two-ways communication, maps and documents sharing in real time. Faster and easier reporting though integrated data visualization and various export options. Real-time information and map sharing within selected users group allows you to inform or instruct your colleagues in field. Multiple user roles ensure that everyone sees only what they need. Real-time GPS & GSM tracking of staff and vehicles movement. GINA set of tools includes a so-phisticated PC application, secured web platform and mobile app. It gives you an access to current locations, movement timelines and much more. Easy-to-use mapping interface allows you to create tailored data layers. Project sites locations, Evacuation plans, Incidents mapping & prediction and other information displayed in various data layers, imported, edited and shared with selected users in real-time. Panic button triggers an immediate e-mail and SMS notification to pre-defined contacts, and a period of a covert sound recording and its transmission. Real-time information and map sharing within selected user group allows you to instruct your staff on ground how to respond to a security incident. Set up geo-fences to receive e-mail and SMS alerts when staff leave safe zones or enter high-risk areas. Real-time GPS & GSM tracking of staff and vehicles movement. GINA set of tools includes sophisticated PC application, secure web platform and mobile app. It gives you to access current locations, movement timelines and much more. Easy-to-use mapping interface allow you to create tailored data layers. Project sites locations, Evacuation plans, Incidents mapping & prediction and other information displayed in various data-layers, imported, edited and shared with selected users in the real-time. Panic button triggers an immediate e-mail and/or SMS notification to pre-defined contacts, and a period of covert sound recording and its transmission. 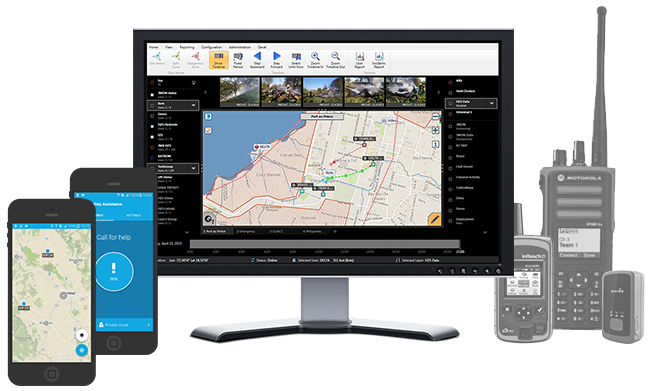 Real-time information and map sharing within selected users group allows you to instruct your staff on ground how to response security incident. Set up geo-fences to receive email and/or SMS alerts when staff leave safe zones or enter high-risk areas. GINA International is a social enterprise that aims at being financially self-sustainable without a need for grants to cover its operational costs. Our core software systems are licensed by GINA Software s.r.o. under very generous terms and conditions. They were later modified specifically for NGOs needs. We engaged with many NGO workers and followed their ideas and suggestions when building the technological solutions. Our thanks goes to people from EISF, NRC, PIN and many others. Together with our partners, we continue developing GINA solution for humanitarian needs. The name GINA stands for Geographic INformation Assistant. The subscription table below shows an average cost of GINA solution. We are always open to offer special terms and conditions if you need GINA for urgent humanitarian purposes. If you don’t have a sufficient budget to cover the subscription, please don’t hesitate to email us. Do you have something else in mind? Feel free to contact us. The subscription table below show average cost of GINA solution. We are always open to offer special terms if you need GINA for urgent humanitarian purposes and you don’t have budget to cover a subscription, please don’t hesitate to email us. GINA solution is available for free or low-cost subscription to all registered humanitarian and development organizations worldwide. COPYRIGHT ® 2019 GINA Software. ALL RIGHTS RESERVED.